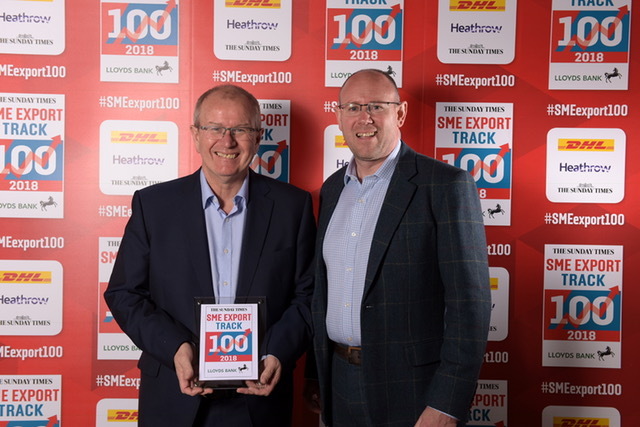 Sanglier Ltd are thrilled to announce that they have been awarded The Sunday Times SME Export Track 2018 award! This award ranks Britains 100 small and medium sized companies with the fastest growing international sales over the past two years. Sanglier accounts its international sales growth of 39.48% pa down to the ever expanding product range which has boosted sales in Europe. Sanglier now ship to multiple countries, with international sales turnover of £5,241,000 last year. This is the third time Sanglier have been awarded the Sunday Times SME award being recognised for growth in 2015 and 2016, Sanglier was also awarded the Queens Award for International Trade in 2017. Nigel Davies and Mike Moran celebrated the award at the special awards dinner in May, in London. Here they were congratulated on their excellent achievement and celebrated with other Nottinghamshire based companies UNiDAYS and Abacus Lighting, who also received the award.